This surgery has unveiled a body that was hiding under pounds of skin. I'm not going to throw away this opportunity to have my healthy life back! I am the smallest in a "large" family with a history of obesity and heart disease. Growing up, it was constantly on my mind that I could balloon at any minute. As a result, I trained myself to portion control and avoid extra things like salad dressing, condiments, and cheese sprinkled on top of anything. I now have a relationship with food that can be defined as "necessary". I know I need food to survive and I usually enjoy eating it. But often I eat because I know I should rather than eating because I want to. If I'm stressed or on an adrenaline kick, I forget to eat. However if I'm bored and looking for something to do, I'll snack on something salty and retain water. When I gain weight it's because I eat the wrong foods, not because I eat too much of it. My definition of good food is somewhat limited. I enjoy food that is equal parts good looking, good tasting, and with limited texture. I eat strawberries sliced in half so my tongue doesn't touch the seeds. I peel off fatty tissue from meat. I eat pizza sideways so I can have equal parts crust and non crust in every bite. My hot dogs have ketchup and only ketchup (unless there's chili in which case there should be only chili.) I'd rather have a slice of fresh baked, buttered sourdough bread than a cupcake. And I don't like cold shredded cheese on top of a hot meal. Ever. After surgery, I now need more protein to help rebuild tissue. This means more food that I didn't like eating in the first place. These are the types of food most people think of when they hear "high protein diet." Instead of constantly eating meat, low-fat dairy, and eggs, I'm drinking something called New Whey Liquid Protein. Each 3.8 ounce tube has 42 grams of protein. 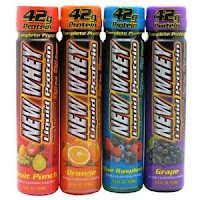 New Whey comes in a variety of super sweet flavors to hide the fact that it tastes awful. I usually chug the tube then drink a cold glass of water to wash out the taste. Low calorie, low sugar, and a ton of protein. It was especially wonderful when I had no appetite in the week after my surgery. There are also protein powders and protein shakes on the market. I personally don't like all of the added sugars or dairy products. I'd rather swig a protein tube than sip leasurely on a chocolate banana flavored frozen ingredients that's pretending to be ice cream. And can we discuss beef jerkey? It's portable, enjoyable at any temperature, and delicious. (Just remember you need to refrigerate it after opening and that it only lasts a few days.) I tend to buy the natural beef jerky because of the lower sodium content. The girls also love eating it. So the moral of the story is that when you're heaing, protein protein protein.